Welcome to our guide on OpenNebula KVM Node Installation on CentOS 7. Our last article covered complete steps for Installing OpenNebula Front-end on CentOS 7. You should have a working OpenNebula Front-end server before you proceed since this guide will concentrate on adding a KVM hypervisor to be managed by OpenNebula Front-end server. 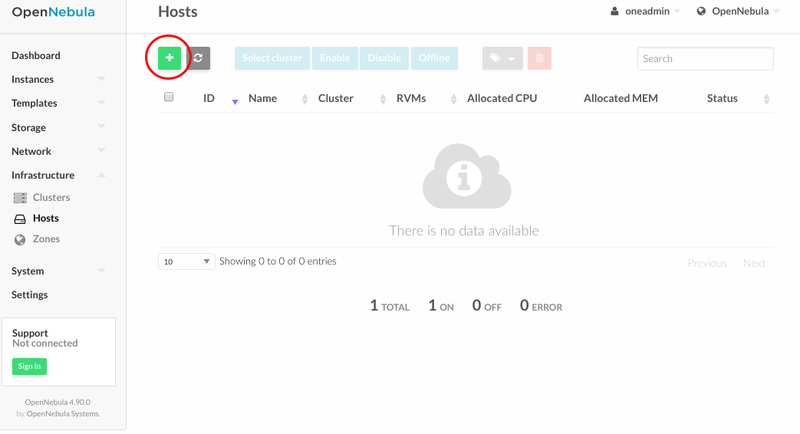 KVM (Kernel-based Virtual Machine) is the hypervisor for OpenNebula’s Open Cloud Architecture. KVM is a complete virtualization system for Linux. It offers full virtualization, where each Virtual Machine interacts with its own virtualized hardware. The Hosts will need a CPU with Intel VT or AMD’s AMD-V features, in order to support virtualization. KVM’s Preparing to use KVM guide will clarify any doubts you may have regarding if your hardware supports KVM. There are a few things you need to make sure are in place before you can install the packages and start the services required. OpenNebula doesn’t work well with SELinux in enforcing mode. Let’s disable it. Run the following commands to add epel and OpenNebula repositories on CentOS 7. Please check the recent version of OpenNebula as you install. As of this writing, the recent version is 5.4. Configures an OpenNebula node providing kvm. For further configuration, check the specific guide: KVM. You should have these line under /etc/libvirt/libvirtd.conf for oneadmin to work well with KVM. Always restart libvirtd when you make a change. 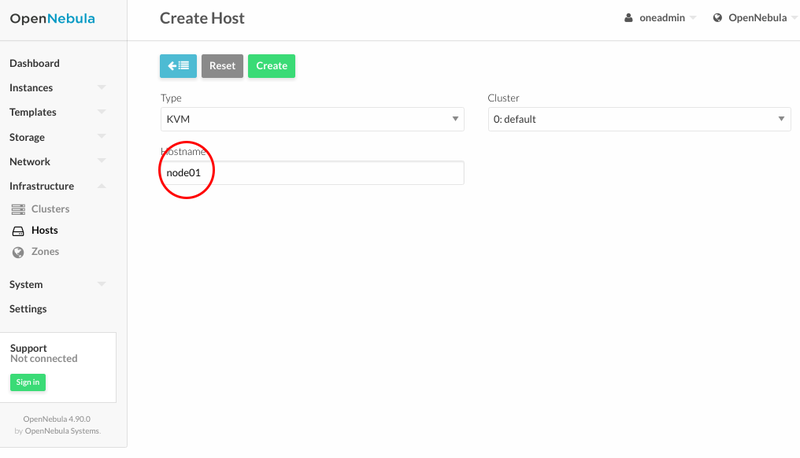 OpenNebula Front-end connects to the hypervisor Hosts using SSH. You must distribute the public key of the useroneadmin from all machines to the file /var/lib/one/.ssh/authorized_keyson all the machines. Now we need to copy the directory /var/lib/one/.ssh to all the nodes. You can reset the password for the oneadmin user on all nodes. A network connection is needed by the OpenNebula Front-end daemons to access the hosts to manage and monitor the Hosts, and to transfer the Image files. It is highly recommended to use a dedicated network for management purposes. Bridged. 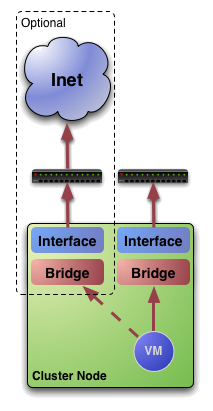 The Virtual Machine is directly attached to an existing bridge in the hypervisor. This mode can be configured to use security groups and network isolation. VLAN. Virtual Networks are implemented through 802.1Q VLAN tagging. VXLAN. Virtual Networks implements VLANs using the VXLAN protocol that relies on a UDP encapsulation and IP multicast. Open vSwitch. Similar to the VLAN mode but using an openvswitch instead of a Linux bridge. Documentation for each is provided on the links. My setup uses Bridged networking. I have three bridges on compute hosts, for storage, a private network, and public data. 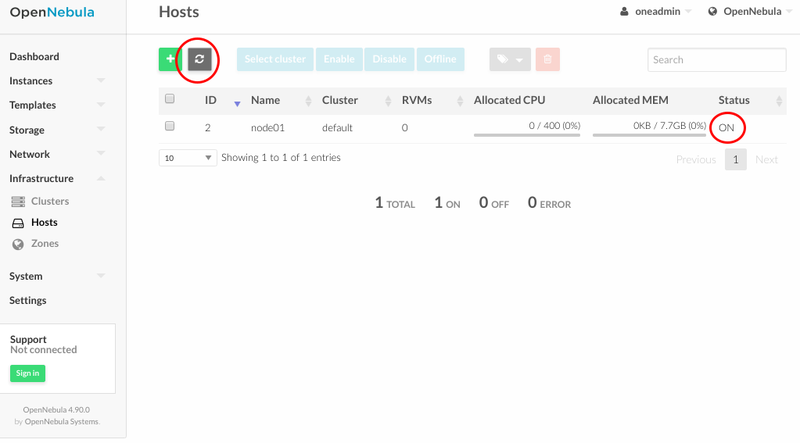 The final step is Adding a Host to OpenNebula. The node is being registered on the OpenNebula Front-end so that OpenNebula can launch VMs on it. This step can be done in the CLI or in Sunstone, the graphical user interface. Follow just one method, not both, as they accomplish the same. Open the Sunstone > Infrastructure -> Hosts. Click on the + button. Select KVM for type field. The fill in the fqdn or IP address of the node in the Hostname field. Go back to the hosts’ section and confirm it’s in ON state. If the host turns to the stateerr instead of,on check./var/log/one/oned.log Chances are it’s a problem with the SSH! This is the end of OpenNebula KVM Node Installation on CentOS 7. In the next guide, we’ll cover Virtual configurations and Storage.